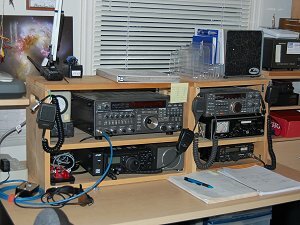 Yet another ham radio website. 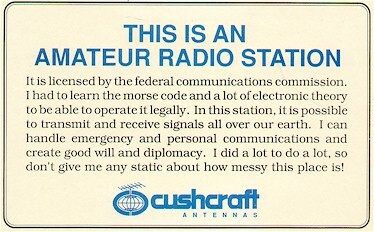 I will use my radios . . . I will update my websites . . . It's all about the content - in the beginning my first website was to prove to myself that it could be done. That was about 1994. I could tell that most of what I had for sharing was gonna be ham radio related. 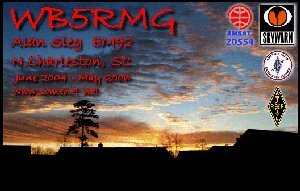 By 1996 I had split my web world into the 'alan' site and the 'wb5rmg' site. In 1998 I registered the name 'SomeNet.NET', and they lived on my own hardware. 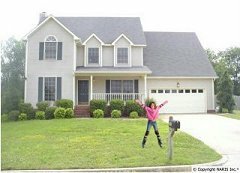 My personal site evolved thru different html generation platforms, but the RMG site hung on with raw html editing for a while longer. Maybe about 2003 I started using a WYSIWYG style editor 'KomPozer' to help generate tables and a maintain a fairly consistent presentation. 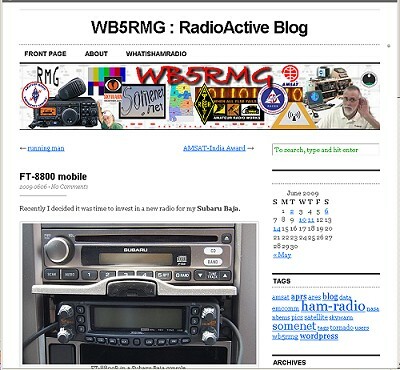 Shortly after that, I setup WordPress on my server to manage my personal site as a Blog - and it still appears as www.somenet.net ... which includes some ham radio related posts, and pointers into the original radio web site. While it is nice to have my own server, sometimes it feels like it gets in the way of just having a place to put stuff, without having to mess with it. When I have the ability to custom tweak a lot of features and make things behave a certain way (my way of course) - I tend to spend more time messin with the stuff, than I do actually just generating the content. WordPress.com tries to make it easy for folks with this affliction - I can now build a site on their server, using their software (which they regularly upgrade - not me), and take advantage of all their latest and greatest tools and widgets, and other cool tricks. I do sacrifice a tiny bit of custom-geek-tweaking - but they have built a lot of power into the content management capabilities... I think I'll come out ahead in the long run. So with this introduction . . . . . Please add this new site as a bookmark, or favorite - and come back now and then to see what else has been added. This old html site will continue on, mostly to host the last decade or so of content that's already in here, but to also provide a home for the random bits of stuff that just won't fit into a blog structure very well. Enjoy !! The local ARES/RACES organizations are consolidating some of the overhead associated with registration and training of the membership. Join us on the 2nd Thursday evening of each month for a good meeting at the HMC EMA EOC (go to their new website and learn more about this). Remember, the severe weather season is available year-round. Check for current SKYWARN Spotter Classes. 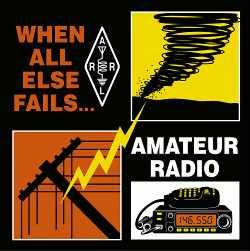 Come out for Field Day in June, as we practice under emergency operating conditions. 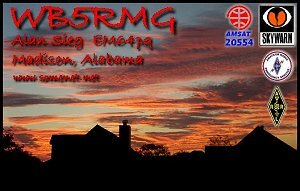 The Huntsville Hamfest is coming in August. Never too early to start planning. 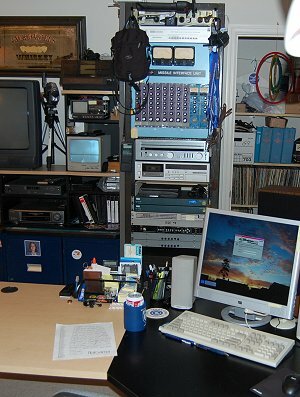 + You can still check www.somenet.net for my personal stuff, just won't have as much ham radio stuff there anymore. + UISS = really neat digital radio program by ON6MU, see his website to download. + Orbitron = very sophisticated satellite tracking program by Sebastian, see his website to download. + VHF Propagation Map = using APRS beacons to visualize current propagation conditions. + APRS.FI = another view of the APRS-IS database, from OH7LZB in Finland. + CWOP = My weather instruments are still active and logging. although I'm not yet satisfied with the radiation shield I made for the external thermometer. The reading is still too high in full sun. (check my reports via FindU). + eQSL.cc = I am actually getting some more of my old logs entered . . .
+ 2009 . . .
+ 2008 . . .
+ 2007 . . .
+ 2006 . . .
+ 2005 . . . This generated image shows the current orbital position of the International Space Station . . . Thanks to www.heavens-above.com for excellent tracking and visual observation schedules. I really enjoy stepping outside to watch this beautiful machine fly over. Thanks to Chris Peat's excellent web site, we can know exactly when and where to watch for this and many other satellites. Recently put in a real desk for my 'office'.